Another classic Gryce contrafact (this time based on Out Of Nowhere changes): Gigi's Latin melody is preceded by an eight-measure set up intro (check out how Gigi develops this intro in the second recording), swing solos, second parts, and a great shout chorus. With this Gryce composition you can be worry-free and just have fun, especially with "The Gigi Gryce Project" Minus You audio tracks. 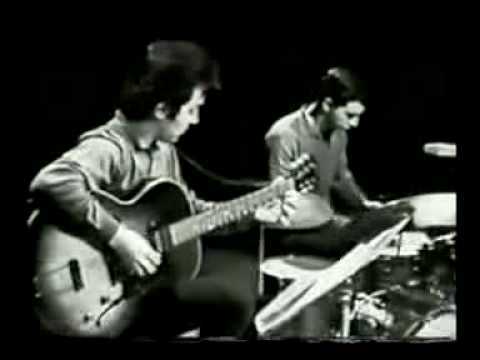 Lenny Breau, guitar; with Dave Young, bass; Wayne Finucan, drums; unknown trumpet and alto sax; on TV in 1961. Our audio excerpt starts with an eight-measure intro for all members of the quintet (clearly notated in all parts). This is a classic Gigi Gryce melody based on "Out Of Nowhere" changes. The melody is Latin and the solos are swing. Gigi's entire arrangement is notated including his "shout chorus." The shout chorus is another interesting melody, this time swing; the new melody's two A sections are also based on "Out Of Nowhere" changes. The rest of the shout chorus on the original recording is a Bass solo. Chord symbols are in all parts so anyone can solo in this section of the "shout." In addition to the horn melody lead sheets, separate second parts are also available so you can play it, as Gigi originally did, with a quintet. This is the first recording of Sans Souci. Gigi also recorded it with Donald Byrd in 1957, and Gigi's old boss Lionel Hampton recorded it in 1982 and 1983. Gigi, along with Clifford Brown and others, were in Hampton's 1953 band, discussed in other historical notes (see Salute To Birdland, for example). Check out other titles recorded on this album. As with Social Call, the tempo is much faster on the Donald Byrd recording than on the original one with Art Farmer. Not much else is different about this version. The intro and coda are longer and feature pianist Tommy Flanagan on celeste. The intro is repeated twice; the first time begins with four measures of solo celeste, with bass entering in the fifth measure and drums in the seventh. The horns come in the second time through the intro; the reverse situation happens in the coda, which begins with the horns on the melody and then vamps and fades with the rhythm section while the horns hold the last note. This album also contains a version of Blue Concept [coming soon] and a nonet arrangement of Nica's Tempo. Click on Blue Concept for more details about the three albums titled "Jazz Lab" The rhythm section on this session also recorded in 1959 with vibraphonist Lem Winchester. Tommy Flanagan and Wendell Marshall, who first recorded together on this Jazz Lab session, went on to record extensively together in the early '60s with Coleman Hawkins, Kenny Burrell, Bobby Jaspar and others. Flanagan and Art Taylor had done two albums together previously to the Jazz Lab session, one with Burrell and one with Miles Davis; they had also recorded with Milt Jackson and John Jenkins by the time of their appearance on John Coltrane's classic "Giant Steps" album. Our "Gigi Gryce Project" version splits the difference in tempo between those of the slower Art Farmer and faster Jazz Lab Quintet recordings. The arrangement differs from both versions mostly in the intro and coda. The intro is an extension of the first recording's intro: the eight-measure phrase is first played by the piano (with bass and drums), then improvised over by flute (four measures) and tenor sax (four measures); the two horns then play the intro melody a third time with the piano soloing. The horns play the same melody for the coda; the eight-measure phrase is played one more time to the last chord, with the horns again trading. The Minus Melody tracks do not have the shout/bass solo chorus which is in our Minus You tracks for piano, bass, and drums. For the sake of consistency, we have labeled the two eight-measure phrases of the coda X and Y for both the melody and rhythm section parts, so that they have the same letters whether or not there is a shout chorus. Bobby Porcelli, long-time friend and often bandmate of Don Sickler, was a perfect foil for Ralph Moore's tenor sax. In this track, Bobby switches to flute, even for his solo.